The CTD data were supplied to BODC in 73 PStar files and converted BODC's internal format, a netCDF subset. Following transfer the data were screened using BODC in-house visualisation software. Suspect data values were identified during screening and appropriate quality flags were applied. Missing data values were changed to the missing data value and assigned a BODC data quality flag. In total, 73 CTD stations were completed on cruise PO314 to produce vertical profiles of the temperature and salinity of the water column. Depths of the profiles ranged from 27m to 2685m. In addition to temperature, conductivity and pressure sensors, the last 65 CTDs included sensors for dissolved oxygen and chlorophyll. 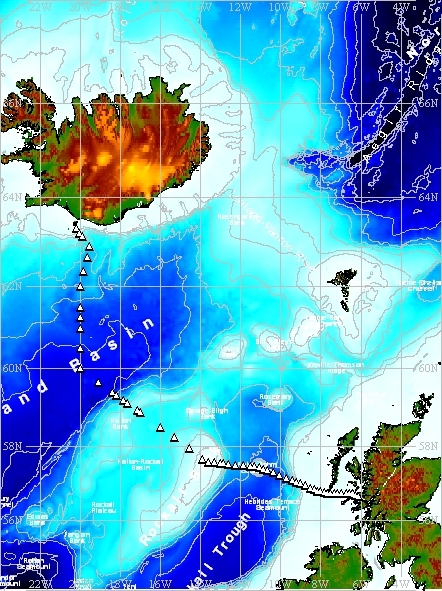 All CTDs were done at fixed stations along the Extended Ellett Line (EEL) transect between Iceland and Scotland. Station IB23S is one of the fixed CTD stations, which together form The Extended Ellett Line. The line lies between Iceland and the Sound of Mull (Scotland) crossing the Iceland Basin and Rockall Trough via the outcrop of Rockall. As part of this initiative, CTD dips, together with associated discrete sampling of the water column, have typically been carried out annually at this station since September 1996.